I have been writing about the withdrawal by the United States of it participation in the Trans Pacific Partnership (TPP) (see here and here). I had previously suggested the importance of TPP frameworks in the construction of systems of global trade rules within which markets advantageous to the U.S might engage and the wariness of those left out from its structures (e.g. here). The United States has now made it clear that its obligations run only to itself and that it will seek to maximize the value (to itself) of its global macro-economic policies through bi lateral relations of one sort or another. Some politicians in smaller states have sought to mimic the approach (e.g. here). But that discussion, along with that of the global press, has been lopsided. It suggests that the United States has driven TPP alone and that it serves as the key to the emerging developments of global frameworks. But that need not be true. First, one must recall that the United States came late to TPP. Second, one must remember that the value of TPP comes from its aggregation of economic power--an aggregation and a power that can be quite powerful even without the United States, and even without China. Third, this power is augmented to the extent that the states that aggregate their power also control significantly important points in global production. With this in mind, and as the remaining TPP states "scramble to save TPP" (here), this post suggests what policy advisors might whisper int the ears of the remaining members of the TPP on their united policies going forward, especially in their relationships with China and the United States. 1. TPP can survive without the United States. There is a sufficient economic power within the remaining TPP signatories to make it a powerful trading block. 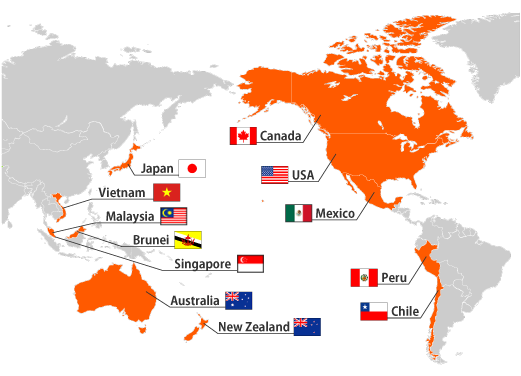 It might be useful for these states to proceed to establish TPP among them, even in the absence of the United States. 2. If TPP is established in the way described in No. 1 then increase members hip in accordance with its framework. I would start with Latin America. That would have the effect of creating a strong Latin American block that could better bargain against both the Chinese--which hope to exploit Latin American as its Western Hemisphere latifundia--and the United States whose benign neglect and casual and disinterested exploitation has been the bane of Latin America for over a century. But I would not end there--including the Philippines, Thailand, Indonesia and Sri Lanka adds another iseful element. 3. More importantly, TPP can serve as the basis within which the United States would have to engage in its bilateral negotiation projects. What this requires s a solidarity of action that would be based on an insistence that all bilateral negotiations between the United States and TPP countries must start with the incorporation of the TPP provisions into the standard forms of whatever model bilateral agreement is used--including the country specific exceptions already negotiated. To aid that effort I might suggest that TPP states immediately hire the former U.S Trade Representative and his staff as experts who might negotiate those points on their behalf. The effect would be an reverse TPP--in which the United States could keep its political promise of formally executing bilateral agreements, but in which the sum of these bilateral agreements functionally replicate TPP. 4. Simultaneously I might consider negotiation with China as a single unit, the basis of which would be the key provisions of TPP. There the only issue of substantial problem might be the SOE provisions, but in that respect some leeway might be possible, especially if it is possible t strip the SOE and the state of its sovereign immunity with respect to its investment decisions (e.g., here). 5. In the absence of TPP, or concerted action based on TPP, the provisions of that partnership might be incorporated inot existing regional trade associaitons. Again the ideal is the construction of robust regional trade associaitons that could be used as the basis of muyltilateral negotiaitons with the United States. 6. To get the most of No. 5 it would be necessary to develop sufficient cohesion that TPP states, or their regional trade associations, would insist that all bilateral negotiations must occur between the United States and the regional trade association. Indeed, one of the hidden potential of the U.S: rejection of TPP is the space it creates to build robust and powerful regional trading, investment and economci bloc that could more effectively bargain with--and against--the United States and China. Neither would favor this development, because it goes against their respective interests. Yet, with the stroke of a pen indulging the backwards looking appetite of American short shortsightedness, the 45th President has provided an opportunity that is rarely given middle tier states. The reason that opportunity is so potent is precisely because the document which would serve as the basis for negotiation had already been fully negotiated, positions well established and the contours of the issues well known. 7. The strategies suggested, one in which TPP could be used as both sword and shield by TPP states (augmented by others seeking its protections against the depredations of the major economic powers in the satisfaction of their respective self interests) can best serve the interests of these smaller and middle tier states only if it is deployed simultaneously against the United States and China. And, it might be undertaken in the knowledge that it may have to be used protectively against India and Russia, whose own ambitions could also overwhelm individual TPP states. 8. The tragedy, of course, is that none of these states will have the foresight either to think in these terms, or to subordinate their own short term petty interests (petty in relation to the benefits of union) to the objectives of aggregating their own political abd economic power to craete an important zone that might eventually serve as the core of a global order that, with time, could serve all peioples fairly and equitably (the emphasis would be over time). 9. And a caveat: The TPP does not define perfection. The sum of its flaws, well known, provide a substantial agenda for refinement going forward. But it has done what might have been thought impossible--providing common ground for states of quite distinct stages of development and wealth to find common ground. That feat itself is worth considering carefully--if only because it is the essential ingredient for the construction of a truly global economic and markets based system, rather than and American or Chinese system in which dependent states participate because they have little choice.